Deal with Additional 20% OFF COUPON! 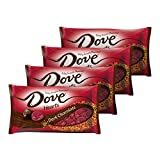 DOVE PROMISES Milk and Dark Chocolate Silky Smooth Heart Candies are one of the best ways to show your loved ones you care this Valentine’s Day. Each chocolate candy comes inscribed with a loving message. Enjoy real milk and dark chocolate in these finely made chocolate candies. They’re also perfect for treating yourself, because we all deserve a little love and chocolate on Valentine’s Day.